Thirty days ago I was hopping in the car to make my daily trip to the Metro. Anxious to complete the short jaunt to get home and get on the bike for the first time in several days. It had rained over the weekend—when hadn’t it rained this Summer-into-Fall?!?!? I hadn’t been on the bike for a week and it was getting close—not at but close–to a semi-end to the decent roadie season for the year. I was anxious to get in a couple solid hours. For some reason I was particular about my kit for the day. It was chilly yet no means cold. I would be on the bike by 8:30ish making it just past the most chilly part of the morning. I’d need a couple layers and full tights to block the cool damp air on my largely first-half shaded route. I opted for my 15+ year old torn tights over a decent, well worn pair of bibs. I opted for my favorite black, skin-tight, Nike long sleeve over nice arm warmers topped by a full zip top. I’d spent the last couple of years in not-as-Sunny-as-you’d-think South Florida. It clouded up and rained plenty. Yet with 99% of my road miles on the road (generally with quite generous bike lanes) the biggest obstacles were traffic and the accumulated scrum within the bike lanes. Even the most wet conditions, which we generally avoided, never felt unsafe as the asphalt seemed to hold up well. Full speed ahead was generally the rule. 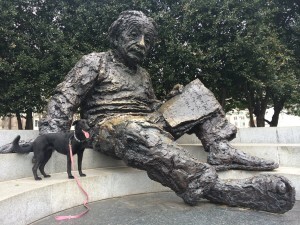 A complete mindset shift was needed to adapt to the largely trail focused skinny-tire riding in the immediate/inner D.C. ring of suburbs and The District itself. Our particular ‘hood sits in a thickly forested, rolling tract of land within general close proximity to a stretch of the Potomac. A complete opposite of our Broward County manicured, pancake flat, palm-tree lined neighborhood. Multi-use trail riding comes more natural to me than endless tarmac-like racing. 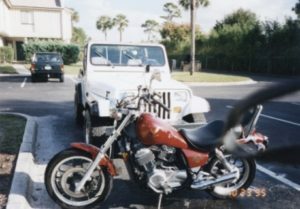 I picked up my first bike as an adult in early 1994. 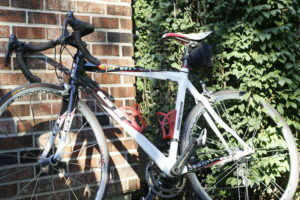 It was a low-end hybrid–today it would be classified as a cyclocross type bike. It was fine for my foray back into riding after decades of not. Now, I had not completely abandoned the two-wheeled lifestyle having owned multiple motorcycles going back to my 16th birthday. I had plenty of experience going fast on two wheels; just not going slow on two wheels! 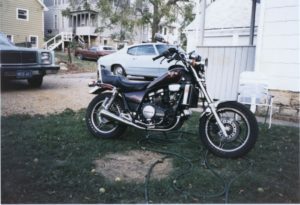 Circa 1995–700cc’s of finely tuned power. Note strategically parked in front of my jeep. Circa 1987–750cc’s of smooooooth power! 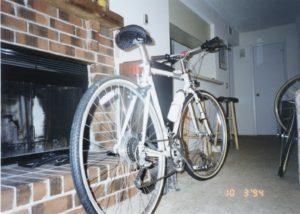 Circa 1994–10 speeds of smooooooth beach cruising! A few years of slow riding down the beaches and tourist roads of Duval and St. John’s Counties followed by miles down and around the Olentangy Trail, the multi-use trails of Central Iowa, the Loop and Line Creek Trail (and connectors) added up to an awful lot of put-down-your-head and ignore a lot of what’s around you. Naturally I had plenty of road miles along the way but I felt more than well positioned to jump right back into the multi-purpose trail life upon moving to our new neighborhood from a couple of years of sweating buckets, fully alert, red-line South Florida road riding. Without much thought around 8:30 a.m. October 29 I aired up Jelly Belly and drifted out of the drive, a crisp, beautiful morning dripping in sunshine and the smells of the previous weekend’s strong rain. I had a general route in mind: through the ‘hood, onto the trail southbound, couple laps around Ft. Hunt Park, down to G.W’s Mt. Vernon………… Forty-five minutes later, less than a mile from my turnaround point I was down.